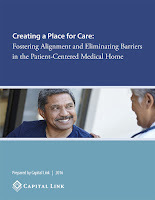 Health centers that have made the decision to obtain certification as a Patient-Centered Medical Home (PCMH) seek to improve quality, outcomes, patient and staff satisfaction, and to prepare for new reimbursement methodologies. However, this endeavor comes with challenges. Capital Link announces the release of two new resources for health centers that support a patient-centered, team-based model of primary care delivery. 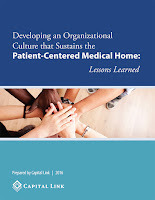 These resources, developed with support from the Health Resources and Services Administration, address the issues health centers face in creating and sustaining an organizational culture and facility design that support a PCMH and provide strategies for success. Developing an Organizational Culture that Sustains the Patient-Centered Medical Home: Lessons Learned examines the cultural challenges and successes health centers face in transforming to this new model of primary care delivery, offering considerations for the patient, family, and staff experience and flexible organizational structures to support team-based care delivery. Creating a Place for Care: Fostering Alignment and Eliminating Barriers in the Patient-Centered Medical Home provides health centers with insight on how to respond to and reflect the unique needs and preferences of the patients they serve in order to align their facility design with their process of care, and the people they support.